Hopefully I have inspired some of you to make your own nut milk at this point. I was surprised and delighted when even my brother in law (definitely not the nut-milk making type!) asked me for the recipe!! I have used all types of nuts so far; cashew, almond, pecan, and hazelnut to be specific. You should know that I have a super cheapy Ronco food dehydrator, which actually works quite well. But your dehydrating time may vary. You could probably also do it on a very low temp in the oven, but I haven’t tried it. I wasn’t exactly sure what I was going to do with them all, but I just kept chucking them in this container every few days. 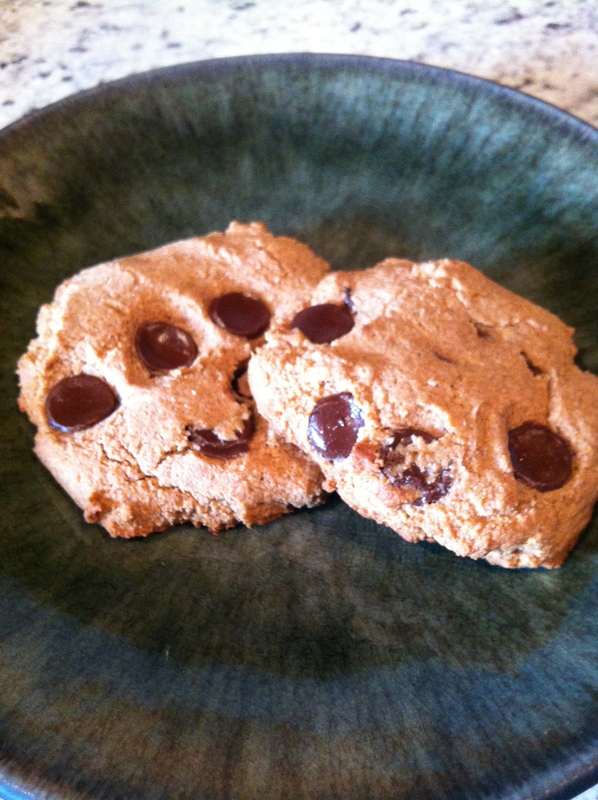 Today I was finally inspired to make my favorite chocolate chip cookies that call for blanched almond flour. 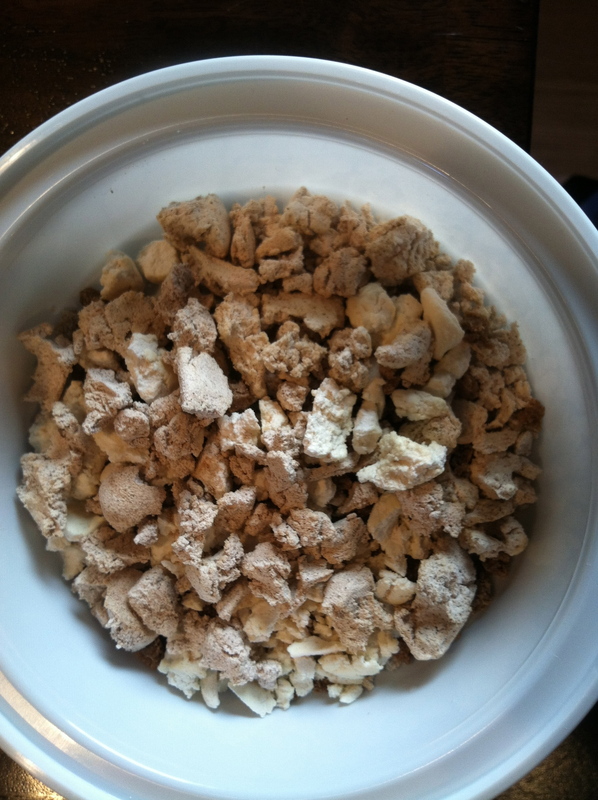 I put the dehydrated nut pulp chunks into the dry canister of my Vitamix and whizzed it all up until it made nut flour. 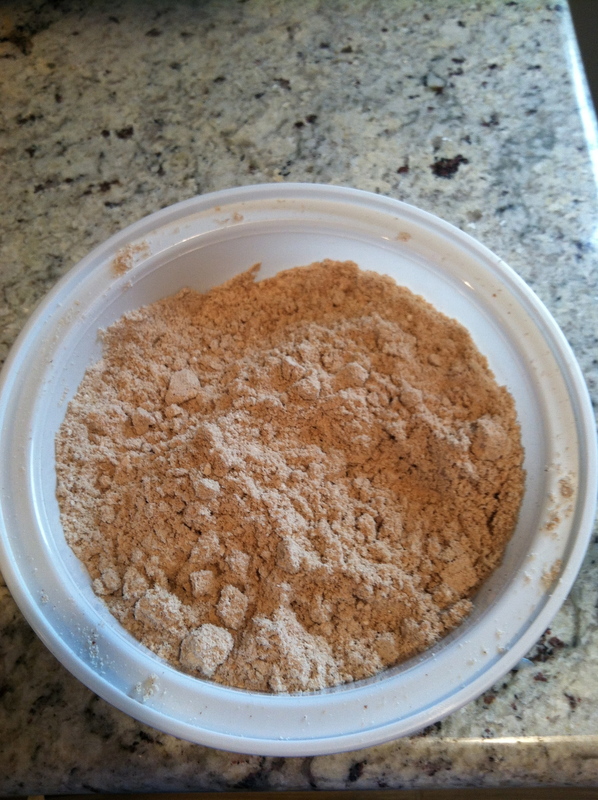 Raw almond/pecan/hazelnut flour!! That had hints of vanilla, cinnamon, and maple syrup from the nut milk mixture. It was delicious and came out pretty finely ground. I did take the skins off the almonds after soaking because I don’t like how they flavor the milk. So this might have made the texture of the flour a little finer, not sure. My son and I made these cookies and they were deeee-licious. Not so FODMAP friendly because they do have a little honey and coconut flour, but so so good. Maybe I will try to make them over without those ingredients one of these days.. In the meantime, save your nut pulp and make flour. It’s amazing! And nutritious! Some people have a beef with nut flour because it is such concentrated protein and fat, but I say eat the treats made with them on special occasions and only in moderation, and you will be just fine! I’d love to hear what you do with your nut pulp!!? I hope everyone had a wonderful holiday filled with family, friends, delicious food, and laughter. We actually ended up staying home from our celebration, as my son was sick AGAIN! He is all better today, but we’ve been in the house a lot with little ills more often than I would like to admit. 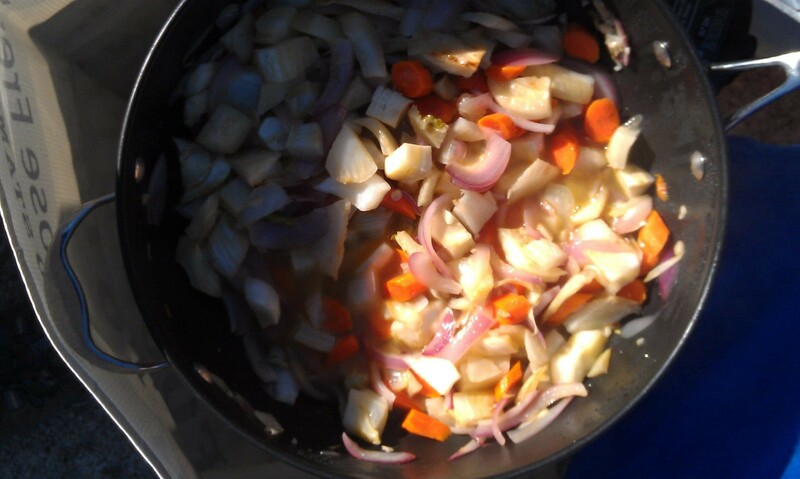 I’ve been cooking up chicken broth, and we’ve been taking probiotics and elderberry daily too. I know it’s helping, but little kids just seem to be susceptible to every little germ out there!! 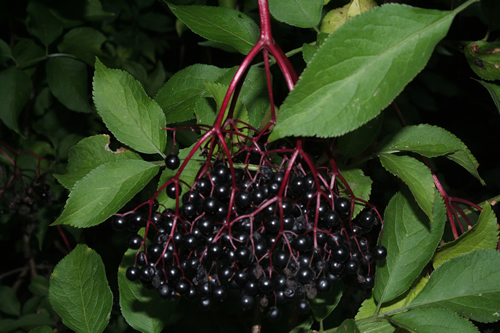 Do you know about the wonderful Elderberry? So first of all it is a berry, so of course contains antioxidants, which are great for warding off cancer and various other diseases. It has long been used to treat respiratory diseases such as cold and flu, and some evidence suggests that elder may help reduce sinus swelling and nasal congestion. Studies have also suggested that the little elderberry has some amazing powers, such as possibly reducing the duration of flu by 3 days as well as reducing flu symptoms. One study even showed elderberry extract actually killing the H1N1 flu virus in a test tube!!? 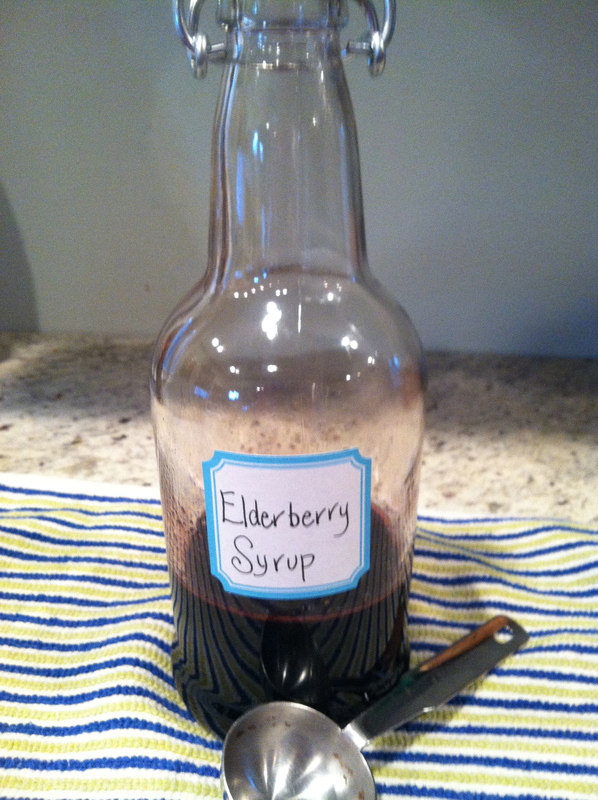 So I’ve been buying a prepared Elderberry Syrup for years that I think has been effective in helping us fight the flu. But this year I decided to get crafty and try making some myself. The original recipe I used was too sweet for our liking, so I reduced the honey a bit and it came out just great. We have been using it once a day for prevention and more frequently when sick or trying to fight something off. We have been taking 1 tablespoon a day for adults and 1 teaspoon a day for children (skipping a day at least once a week) and up to 4 tablespoons a day for adults and 3 teaspoons a day for children when sick or fighting something. This syrup has several other immune boosting and anti-bacterial herbs and spices, and is also really delicious. 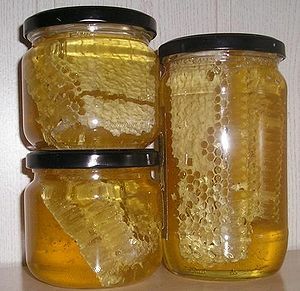 I usually put some in the freezer too; the honey keeps it from freezing too hard and it is so yummy to take frozen. And do use raw honey if you are able, it is full of live enzymes and good stuff that gets killed in the pasteurization/heating process of typical honey. It should be noted that raw elderberries have a chemical in them similar to cyanide, so need to be cooked to make them safe for ingestion. Anyone on medications or with special issues should speak to their doctor before using elderberry. And please remember not to give this syrup to any child under 1 as it contains honey, which can be toxic for little ones. If you are sensitive to honey, or want to give this remedy to your littlest ones, stay tuned for an updated post soon. My next batch will be made with maple syrup, as I have embarked on a new diet to help with my IBS, a low FODMAP foods diet, but more on this later! And here it is, I know you’ve been waiting for it, another use for the nut milk bag! When the syrup is done it needs to be strained, which can be done through a fine mesh strainer, cheesecloth, or, you guessed it, nut milk bag! I used my nut milk bag last time and was really pleased because I was really able to squeeze all the elder-goodness out at the end. Add all ingredients except honey to a small saucepan and bring to a boil. Turn the heat down to a simmer and let the mixture reduce by half, about 30-40 minutes. Remove the mixture from the heat and strain through a fine mesh strainer, cheesecloth, or nut milk bag. When the mixture has cooled but is still warm (118 degrees F or less) whisk in the honey and store in a glass jar in the fridge, or in the freezer. The mixture should keep in the fridge for a few weeks. I’d love to hear what you use to keep your family healthy during cold and flu season! Natural sweeteners are definitely big news lately. From classics like molasses and honey, to new fangled agave and stevia, every week seems to bring about a new favorite, each touting its own unique ‘health’ benefits. Sure, some natural sweeteners contain more nutrients than white sugar, while some digest a little more slowly, thus causing a slower rise in blood sugar levels. But the fact of the matter is that these foods are all still sweeteners, and most of them break down to the same molecules as plain old sugar, and are digested in the same way. Therefore, we should still use moderation with sweeteners, no matter which ones they are. This is especially true for those who need to keep watch on their blood sugar levels. One of the most classic ‘natural’ sweeteners is honey, which comes in many varieties that all lend slightly different subtle flavors. Raw honey, which you can find for sale here at the market, contains a host of enzymes, minerals, amino acids, and antioxidants along with natural sugars. Raw honey is nutritionally superior to pasteurized or processed honey because many of the beneficial properties are lost when honey is heated. There is also some evidence that eating locally produced raw honey, which contain local pollen spores, can help alleviate seasonal allergies by acting to build immunity much like a vaccine would. Unfortunately, there are no studies yet to back up this belief. Honey is also a natural humectant (something that attracts and retains moisture), so it can help to keep a dish moist when used in a recipe, or retain moisture in the skin when used in a skin care product. Honey is also known to soothe and coat a sore throat, and one study has shown that buckwheat honey provided better relief for nighttime cough in children than an over the counter cough medication! However, please note that it is not considered safe to give honey to children under 1 year of age because of the risk of botulism poisoning. Honey may naturally contain spores of Clostridium Botulinum, a toxin which adult digestive systems can easily fight off, but could sicken a young child. Another classic is of course maple syrup, which has it’s own wonderful and distinct flavor. Recent research shows that maple syrup is high in polyphenols, an antioxidant that helps ward off inflammation as well as supplying the minerals manganese and zinc. Maple sugar has become very popular lately too, and is made by boiling down maple syrup until all of the liquid has evaporated. It should be noted that maple sugar is about twice as sweet as regular sugar. It is recommended to use ¾ cup of maple syrup for every 1 cup of granulated sugar called for in baking, and reduce the amount of liquid in the recipe by 3 tablespoons for every 1 cup of maple syrup used. When substituting honey for sugar in baking, Heidi Swanson, author of Super Natural Cooking, recommends substituting ½ cup honey for every cup of sugar, reducing the liquid in the recipe by ¼ cup, and increasing the baking soda by ¼ tsp. It is also advisable to turn down the oven temperature by 25 degrees to prevent overbrowning. The recipe for this week, Sweet and Sour Braised Fennel, was simple and so warming and delicious. Especially on a VERY cold and windy day at the market. The weather conditions made the stove a little hard to deal with, but the result made it all worthwhile. I of course substituted honey instead of the sugar that the recipe called for!